If you've gotten one of those increasingly rare holiday bonus checks recently, you may want to splurge on some of the goodies at auction from two of Manhattan's closed and soon-to-close icons, Cafe des Artistes and Tavern on the Grill. Items from the first are already being sold (except for the famous murals). Tavern's goodies, including some from Maxwell's Plum and the original Russian Tea Room, go on sale January 13. There's even discussion, as of today, of offering up the Tavern on the Green name for sale. Such sad endings to such beautiful restaurants (no comment on the food, however). Is there anywhere to see what items are being sold? A website? For Tavern on the Green information, go to http://www.guernseys.com. 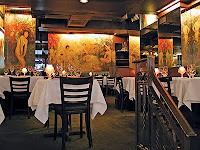 Contact trustee John Pereira at 212-758-5777 for more information about Cafe des Artistes.